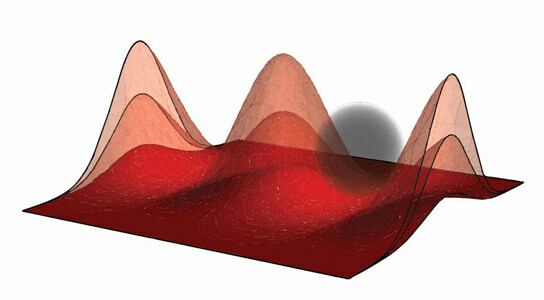 By modulating a lattice of laser beams, University of Michigan physicists were able to trap a giant atom and demonstrate a new way to manipulate its outer electron that exhibits 1000 times better precision than previously possible. In a new study, researchers at the University of Michigan detail how they used light to study and control matter with 1,000 times better resolution and precision than previously possible. Physicists at the University of Michigan have demonstrated “ponderomotive spectroscopy,” an advanced form of a technique that was born in the 15th century when Isaac Newton first showed that white light sent through a prism breaks into a rainbow. Spectroscopy is essential to many branches of science. The term broadly refers to the use of light, often from lasers, to observe, measure and manipulate matter. With it, scientists can detect trace amounts of pollutants. They can identify elements in the atmospheres of planets outside the solar system. And they laid the groundwork for computing and information processing. Those are just a few examples of how it has been used. The new high-resolution spectroscopy allows researchers to peer more deeply into the structure of atoms and direct their behavior at a much finer scale. It could have applications in quantum computing, which aims to use particles such as atoms or electrons to perform information processing and memory tasks. Quantum computers could offer big boosts in computing power because they’d carry out scores of calculations at once. Their purported ability to factor numbers much faster than their conventional counterparts could bring improvements in computer security as well. In addition, measurements that the new spectroscopy makes possible could lead to new understandings of fundamental physics, said Kaitlin Moore, a doctoral student in applied physics in the U-M College of Literature, Science, and the Arts. “The freedom of access our technique offers could be game-changing for characterizing atoms and molecules, as well for all the physics that stems from these kinds of measurements,” Moore said. To demonstrate their technique, the researchers started with atoms of the soft metal rubidium. In rubidium atoms, just one electron occupies the outer valence shell. With finely tuned lasers, they excited this outer electron enough to move it 100 times farther away from the atom’s nucleus. This turned it into what’s called a Rydberg atom – a giant that exhibits not only greater size, but also much stronger interactions. Because of these properties, Rydberg atoms are candidates for the circuits of future quantum computers. Next, the researchers generated a lattice of laser beams that formed a sort of egg carton of light. This lattice is what gave rise to the ponderomotive force that’s essential to their approach. The ponderomotive interaction is present in all light fields. But the researchers found that by pulsating the laser beams at certain rates over time, they could use the field to both trap the whole Rydberg atom by holding fast to its outer electron, and induce in that atom a real quantum leap that would be forbidden with traditional spectroscopy. The scientific term for “quantum leap” is “atomic transition,” and it refers to a change in the quantum state of an electron in an atom. A change in quantum state is an alteration in either how much energy or angular momentum the electron holds. Angular momentum relates to the shape of the electron’s path around the atom’s nucleus. Scientists delineate different shapes with a set of letters you might think of as notes on a piano. With conventional spectroscopy, scientists can only induce angular momentum shifts that amount to one note at a time, and in order. They can’t move an electron from, say, a D to a G shape. And they can’t, for instance, kick one from a middle D to a D in a different pitch. In that type of quantum leap, the electron’s orbit would keep the same shape, but its energy would change. So if the shape were a sphere, and the state change was one to a greater energy, the new state would be a larger sphere. Why would the scientists want to make that happen? Inducing one of these “forbidden” changes would efficiently reveal typically hidden information about the atom’s structure. That’s what ponderomotive spectroscopy can do. The technique lets scientists see and spark a much wider array of electron behaviors than ever before. The selection rules of conventional spectroscopy – the ones that insist atomic transitions occur in order – don’t apply. The research was funded by the Department of Energy, the National Science Foundation and the National Institute of Standards and Technology. 2 Comments on "Physicists Demonstrate Ponderomotive Spectroscopy"
17th century. Or possibly 18th. Also, I’m not sure that spectroscopy actually laid the groundwork for computing and information processing. Otherwise, very nice article.